This plant has everything going for it; it’s fun, fragrant, fast-growing, loaded with beautiful and unusual features, and it offers a very practical solution when the situation calls for quick coverage. 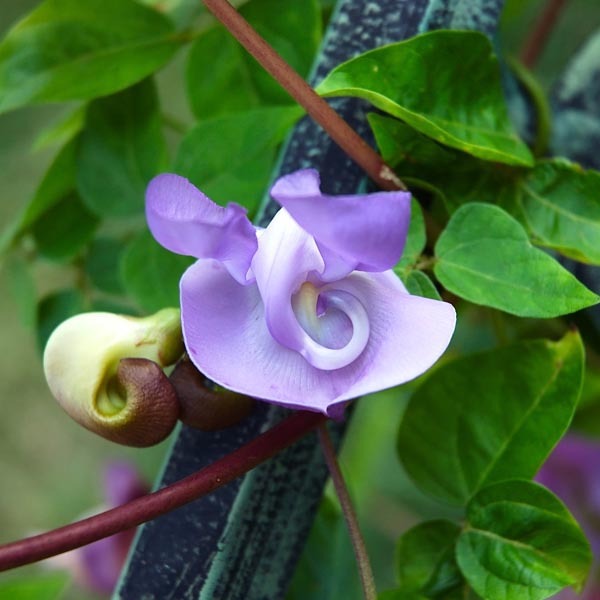 This vine gets its common names from its corkscrew-like flower buds. The buds form a tight spiral that resembles a snail’s shell! Flowers are followed by long, bean-like pods that add even more interest. Corkscrew vine is native to Venezuela and thrives in hot, humid conditions. It is perennial in areas with mild winters. Grow vines on a trellis to add height to the garden or on a lattice to create a privacy screen near a porch, deck or patio. Several planted in a row can quickly conceal an unsightly fence. Can be grown as an indoor potted plant if given a sunny location. Apply a mild granular fertilizer monthly. Water daily during dry, hot weather. Can be pruned to maintain desired size and shape.